Last year, I mentioned why the Browns ought to move practices out of Berea during the summer months (https://intentionalhounding.wordpress.com/2014/06/03/why-possibly-moving-training-camp-is-a-good-idea/). It sounds like the franchise has listened, and will sprinkle in a few new cities during the month of August. Obviously I fully support the team’s decision – let’s review what will go down in the coming weeks. The team will head down Interstate 71 to the state capitol to practice at Ohio Stadium. This will occur on a Friday night (August seventh), so there will likely not be as many in attendance as there would be on a Saturday night. Nonetheless, I expect there to be a bump from last year’s scrimmage held in Infocision Stadium in Akron. 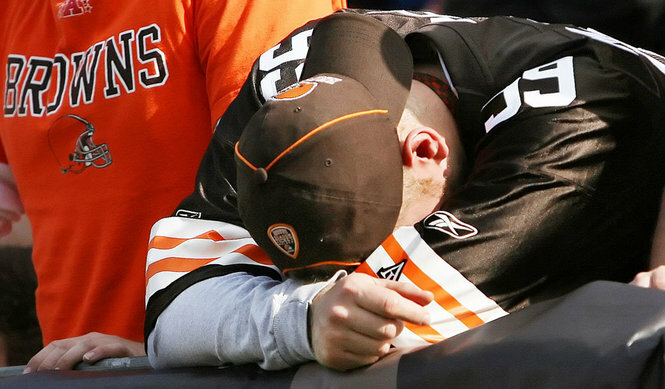 There’s a large fan base of Browns fans in Columbus, and I hope they are out in full force to support the orange and brown. This new tradition of moving the intrasquad scrimmage around, might lead to steady growth – no matter if the team heads to Toledo, Canton, or Dayton. Perhaps fans will get a glimpse of what can be expected from young veterans or the beginning of greatness from a pair of 2014 rookies who struggled mightily. On August seventeenth and eighteenth, the Cleveland Browns and Buffalo Bills will hold joint practices in St. John Fisher College in Pittsford, N.Y., prior to their preseason matchup a few days later in First Energy Stadium. These are foreign to the orange and brown, but several clubs have been a part of these in the past few seasons (most notably the New England Patriots). The Mike Pettine/Rex Ryan storyline should be intriguing during one week of the exhibition season. The former mentor and pupil will be butting heads (maybe literally) both in New York and Ohio. The coaches should excel at firing up their fans during this week – and onlookers should hear a fair amount of pads popping. I could not think of a better coupling for these NFL practices. Once again, if the teams can use this experience to get positive publicity, then it will have been deemed a success. Conclusion: On paper, it would appear that the Cleveland Browns were wise in practicing in front of a few new crowds this summer. Whether it’s in the Buckeye state or not, some new eyeballs will gaze upon the roster. Will this convert onlookers to be new fans of the orange and brown? That remains to be seen, but if they can display toughness, attitude, and camaraderie – perhaps they will finally start to expand their brand name. (Victories in the fall will further this substantially).